With the Room Bookings Pro Edition you can track and manage billings pertaining to room bookings, activities, and catering. Once you have added the fees to your account, you can create invoices to bill for room bookings. When creating a room booking bill you must select a Billing Mode to tell the system how the charges will be applied. Access the room booking details either through search or the calendar. 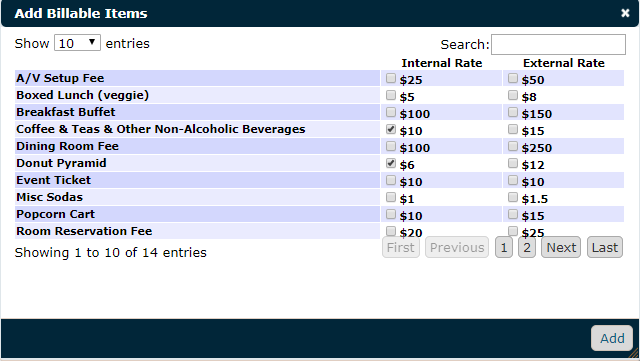 Click on the Billing tab to define in detail exactly how the event should be billed. Select Billable from the Event Billing Status drop down menu. Define your Bill To as either Per Attendee, Host, or Department. This mode is common for some resident activities where there are fees for participation and catering costs. In the Per Attendee mode, all residents on the Attendee tab who were marked as attended will get individual bills. Check the Include Staff box to also create a bill for any staff members who attended. Check the Include Ad-hoc Attendees box to create a bill for family, caregivers, or additional people who have attended. The Include No Show Attendees checkbox overrides the default of only creating bills for those who attended. If you want to create a bill for those who cancelled their sign up or for those who just didn't show, use this option. It's typical that you'd have a specific cancellation fee established to charge in these cases. In this mode, you can choose one person who is responsible for the bill. The person must be an attendee. A great example would be if a resident is throwing a surprise party for his wife in the private dining room. He would get charged as the host, and pay any costs for room fees or catering. Select the Host from the Select Host drop down menu. Click the Plus Icon next to the drop down menu to populate the Charges to Allocate and Bill Details sections below. Use this mode when the fees are coming out of a specific department budget. For example, catering charging fees to the Maintenance department for providing lunch and refreshments to all staff attending an on-site training session. *Note: When in department mode, TheWorxHub doesn't require attendees on the attendee tab, you can just pick a department and contact on the fly when creating the bill. Select the Department name from the drop down. Select a Staff contact for the department. This section allows for the adjustment of the invoice charges before assigning them to a responsible party under Bill Details. If you have set any charges to always be included by default, those charges will automatically show on the Billing tab. You can also add additional charges to the invoice when needed. Any charges associated with catering items that have been added to this Room Booking will populate automatically. If applicable, select a Billing Code from the drop down menu. Adjust the Quantity and the price per quantity (Price/Qty) if needed. Click Split Charge to divide the charge cost evenly between all responsible parties under Bill Details. Click Assign Charge to manually select the party responsible for a particular line item. Click Add a New Charge under Charges to Allocate if there are additional charges that need to be added manually. In the Add Billable Items pop-up, select the checkboxes for the Internal Rate or External Rate for all the charges you wish to include on the bill. Once the Bill To has been determined and charges have been allocated, the Bill Details section should be populated with the persons responsible for billing, as well as the various charges applied to them. Click Remove to get rid of any charges that should not be applied. Click Save to finalize the changes on the Billing tab. Once your invoices have been saved, they will be listed on your Room Bookings Dashboard. You can then export them to Accounting for processing. Click on the Room Booking Billings tab on the left side of the screen. Check the boxes next to the events you need to export. If you need to export them all, click Select All at the top of the list. Click the arrow next to the Export link and select the export option you'd like to use. Once you have successfully exported the invoices, be sure to click the Mark as Sent to Accounting link that appears when you hover over the event. This removes the event from the Room Booking Billings list in order to make room for the next month's billings.